Designed to educate those involved in groundcare on a variety of sports turf topics, this seminar signalled an exciting new chapter in the series and it certainly didn't disappoint the two hundred and fifty strong audience which consisted of volunteers and professionals representing schools, sports clubs, local authorities and contractors. 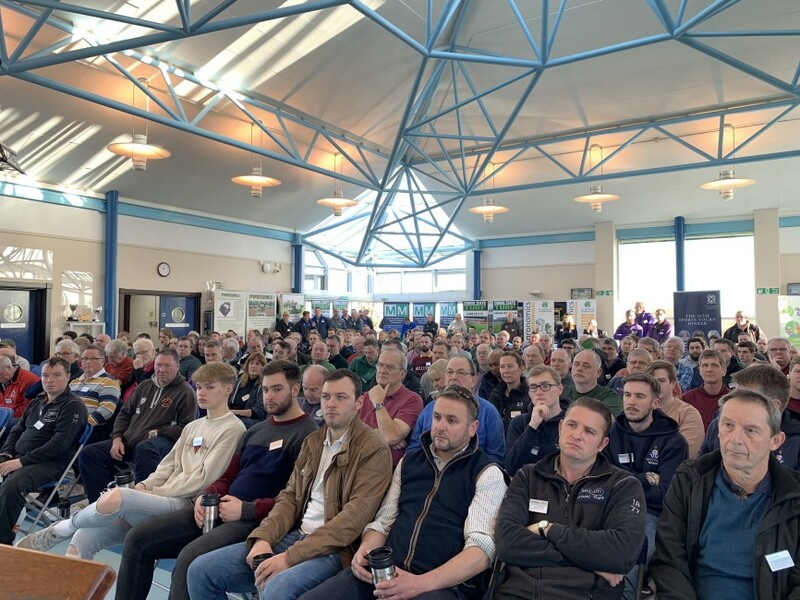 The seminar was well supported by the industry and welcomed a number of key sponsors which included Bernhard and Company, Consolidate Turf, CricketWorld.com, Garside Sands, Harrod Sport, Headland Amenity, Limagrain UK, Poweroll, RT Machinery and SIS Pitches. After an introduction from Dennis and SISIS' Robert Jack, former Rugby Union star Kyran Bracken, arguably best known for his heroics in England's victorious 2003 World Cup win, took to the stage to relay some highly interesting and humorous stories about that memorable campaign in Australia. It was then straight to business with back-to-back presentations from key speakers Rob Kendle (ATB Sports Solutions), Dr. Iain James (TGMS Ltd) and Alex Vickers (IOG consultant). Rob started proceedings by discussing best practice in renovating and rejuvenating a surface; Iain followed with a plethora of advice on how to get the most out of a sportsground construction project and Alex gave the audience a fantastic insight into drainage on sports pitches. A complimentary lunch signalled the halfway point and attendees had the opportunity to network with one another and discuss individual projects with event sponsors. Once refreshed, delegates settled into their seats for an afternoon feast of knowledge served by Chris Wood (ECB pitch consultant) and Keith Kent (RFU head groundsman, Twickenham). Keith drew on his wealth of experience as a groundsman to explore the transformation of winter sports pitches into cricket outfields and Chris reflected on 50 years in cricket groundsmanship in which he focussed on vital techniques before discussing emerging trends which could become essential in the not too distant future. The day concluded with a special recognition award by Tim Lamb, former chief executive of the ECB, to Chris Wood for his outstanding contribution to the game of cricket over the past 50 years, which also saw a standing ovation from the crowd. "We are currently having drainage issues with one of our pitches and fortunately today's seminar has covered this at length," she said. "In fact, we are in the process of trying to persuade our council to let us take over a contract for some grounds maintenance work and the knowledge we have gained today will only help our cause because we now feel confident that we can go back to them and showcase that we have the ability to do the work successfully. We have taken something from every element of this seminar and it has been invaluable." Nick Lockhart, cricket professional and head of grounds and gardens at Felsted School in Essex, brought two members of staff along with him and believes the Dennis and SISIS seminars are essential for anyone who wants to take their sports surfaces to the next level. "It has been thoroughly enjoyable, informative and thought provoking. I would go as far as saying that it is a must-attend event for people in this industry. It has been incredibly interesting listening to all of the speakers who have all raised great points that we can take away with us and put into practice. Speakers aside, the networking opportunities are also important because it gives us a chance to speak to other delegates, find out what they might be doing differently to us and hopefully learn from them too." Echoing Nick was Andy Mackay, head groundsman at Sussex CCC, who said that the line-up of speakers was just too good to ignore. "The quality of speakers at this particular event was a huge draw in my decision to come. I've been in turf for over 20 years and I still learn something new every single time I listen to Alex Vickers. The general atmosphere of the event was worth coming for and the whole programme was spectacular." Keith Kent may well be responsible for one of the most prestigious stadiums in world sport but claims that every day should still be a learning day. "I think that as part of everybody's education every day should be a school day and a seminar such as this, where there are such high-quality speakers, is a vital opportunity to progress. For me, it is all about the education and that is why I've brought my staff along. I like them to see what I do because I don't want to be the boss who just disappears. They have come along, enjoyed the day, picked up new ideas and met lots of people from a range of different sports." Further information about the range of cricket maintenance products available can be found by visiting www.dennisuk.com / www.sisis.com.